I spent some time this week browsing through & cleaning up my boards on Pinterest…and it proved to be a fruitful exercise. 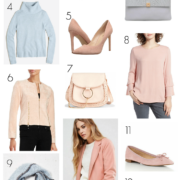 While doing so, I realized that most of the outfit pictures I’m drawn to & inspired by are really simple looks. Sometimes the chicest combinations are just basic pieces combined with interesting details. A lace-embellished collar on a silky white button-down + a classic pencil skirt in sleek (faux) leather + mixed metal dainty bracelets = simple sophistication. Very sophisticated and elegant look! Love your blouse, esp. it's collar! I simply adore this look! So soft and feminine. You look really lovely in a pencil skirt. I surely agree and I love those shoes of yours.Simple is the best. Very sophisticated, and very gorgeous! Love this look. Gorgeous! Need to see more pics of the shoes next time… curious about those. 🙂 Well those and one other that I just saw STylish Housewife wearing. Very chic! Aren't leather pencil skirts the best? Love this outfit! It is very simple but very sophisticated and chic just like you were going for. That skirt is amazing and fits you perfectly! Also loving the bracelets- I really need to check out Poshlocket. OMG I need those bracelets. I have the sandals coming in the mail TODAY and I can't wait to wear them. I'm totally with you on the simple sophistication! Great outfit! I really love how you mixed the leather and lace. This look is great! Gorgeous girl! I just love those bracelets! So sophisticated. This outfit is perfection! Love everything about it. SO chic – the skirt looks really nice (shocked it is from Forever21!!!). I love how interesting details (like a lace collar on a white blouse and a black skirt in leather) can really change the look of an otherwise simple outfit. Those sandals are amazing, and I've decided that I'm ordering that arrow bracelet! I agree with you! simplicity is the ultimate form of sophistication! love your outfit dear, you look simply chic! Beautiful look, I'm loving the simplistic look with lovely details. I try to remember what Coco Chanel said – before you leave the house, look in the mirror and take one thing off. That having been said, I definitely DO have my 'magpie' days, but I KNOW I am a spectacle. I love this, you look beautiful! Those shoes are killer girl! This outfit is simply beautiful. Chic look! Loving the pop of color with your sandals! Simple and classic is always the best way to go!!! Perfect outfit for most any age. Looks like a million bucks! So funny to see you wearing the same sandals I just posted on my blog – we have a psychic link I swear! This is such a lovely look for its simple elegance. I'm a big fan of a skirt, I've been after something like this for a while, I own a linen/leather skirt but it's shorter – yours is a great length. Now aren't those shoes super comfortable? This outfit is beautiful! I love the shoes and the bag. You are great at accessorizing! After seeing and loving the shoes on you, I bought a pair for myself. Thanks for the inspiration! Great outfit, love your bracelets. This is a very sophisticated look! What I love about it is that you can wear it out to a dinner AND to the office. Love! YOu look gorgeous and I am in love with that skirt!! Amazing look! 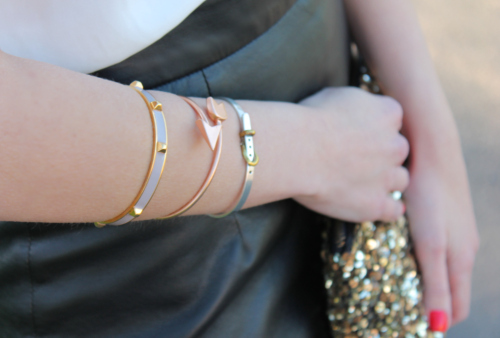 Love your skirt & all of your bracelets! wow! you are so chic! i love your bracelets!!!!! simply gorgeous and so elegant! These Zara sandals are so so pretty! You look perfect! Hope you are having a wonderful day! Simply stunning. This is one of my favorite looks that you've shared. Perfect. ohhhh I love you outfit! 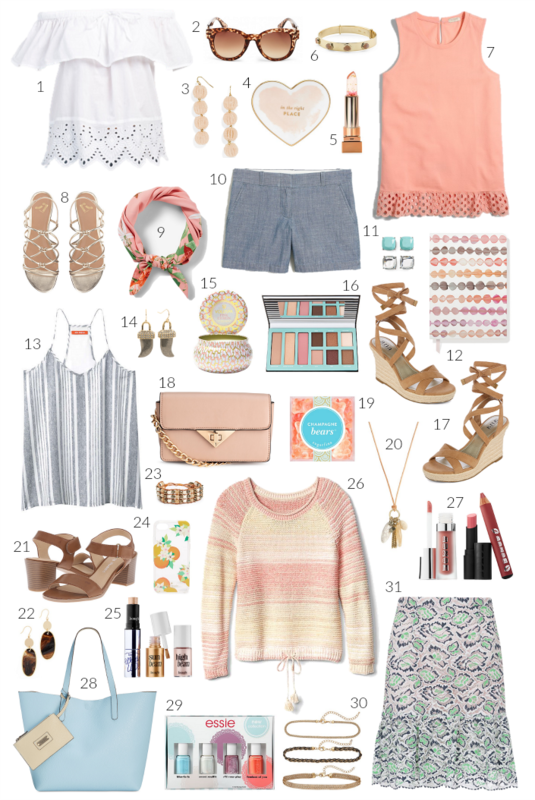 I especially love you outfit on What We Wore Stripes Challenge… Great job!!! You always look flawless, seriously. Love the jewelry. Whoever takes your pics does an amazing job. I LOVE those shoes! So fantastic! And the bracelets are all so pretty, too! That skirt looks so expensive, you'd never guess it's F21!